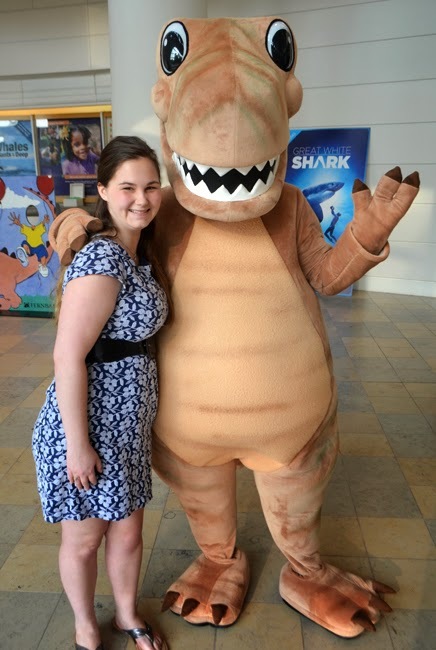 Last Friday night I went to Martinis & IMAX at Fernbank Museum of Natural History and got a quadruple treat! Not only did we get to see Great White Shark on IMAX and later enjoyed live music and cocktails in the Great Hall with other dear friends, but I finally got to meet my favorite dinosaur, Giggy A. Dinosaur, who has his own Facebook page by the way, AND we ran into Rachel, too! That's Rachel with Giggy. Barry and I met Rachel at Georgia Aquarium when we did the Journey With Gentle Giants experience—we went swimming with Whale Sharks and Manta Ray! If I ever doubted that Barry doesn't forget a face, I never will again. When we first met Rachel she was a tour guide at the Aquarium, but is now in school studying marine biology. She, I think as much as me, totally enjoyed meeting Giggy! Some of you already know that before I wanted to be an astronaut (which I'm not, unfortunately) I wanted to be an archaeologist. Yes, I'm all over the map! But, suffice it to say that I've been a dinosaur enthusiast since I was a little kid. I've been following Giggy for quite some time...since June 2011, in fact. He's the smartest, most clever, and most fun dinosaur I know! What a great sense of humor...who knew dinosaurs were so funny?! The timing couldn't have been better! August is Dinosaur Month at Fernbank! There are lots of activities throughout the month, including a big Dinosaur Birthday Bash on Saturday, August 23, featuring lots of family fun! Do you know someone who would enjoy meeting Giggy? I've seen quite a few IMAX films over the years and Great White Shark delivers right along with the rest of so many of the IMAX greats. I wasn't sure what to expect—presumably they'd talk about JAWS and the killer reputation of the Great White Shark...but it was something else. Compassion. Great White Shark noted the fact that this creature predates the dinosaurs—sorry, Giggy—and what an incredibly awesome creature it is. And quite surprisingly, it shares the fact that we very often swim in the same waters as they do...most of us just never knew it. As it turns out, many of the populations of the Great White Shark—a creature that can be found around the globe—have been decimated, almost to the point of eradication. The film shows some of the little that we know about them, a little about Great White Shark tourism—yes, there's such a thing! And in the middle of the film is my favorite footage that shows the grandeur and majesty of these creatures. I knew these things were big, but Wow! Shark Week started yesterday...are you watching? ...and everything else there is to do at Fernbank! P.S. I mentioned swimming with the Whale Sharks, which included swimming with other sharks, too...check out the video here: Travis and Barry's Journey With Gentle Giants experience.